TIRUPUR: Prime Minister Narendra Modi inaugurated the passenger service in the final leg of Phase I of Chennai Metro and laid the foundation stone for ESIC hospital at Tiruppur, the integrated building at Tiruchy airport and modernisation of Chennai Airport here on Sunday evening. On the stage, Tamil Nadu Chief Minister Edappadi K Palaniswami greeted Prime Minister Narendra Modi with a memento. Subsequently, an audio-visual presentation of the proposed 100-bed ESI hospital at Tirupur, the integrated building at Tiruchy Airport and modernisation of Chennai Airport were played, after which Modi laid the foundation stone for the three projects. He then dedicated the ESIC Medical College and Post Graduate Institute of Medical Science and Research (PGIMSR) and 470-bed ESIC hospital at KK Nagar in Chennai, Ennore coastal terminal and new crude oil pipeline from Chennai port to Manali refinery. 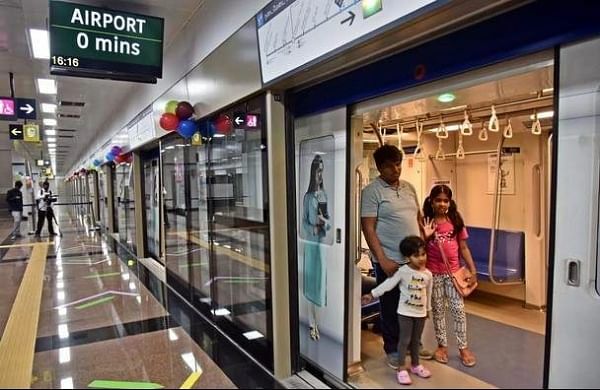 Finally, Modi along with the Palaniswami and Deputy Chief Minister O Panneerselvam flagged off the passenger service in the final leg of phase I of Chennai Metro. Governor Banwarilal Purohit, Union Minister Pon Radhakrishnan, State Animal Husbandry Minister Udumalai K Radhakrishnan were also part of the event. The government event lasted only close to 10 minutes and neither Tamil Thai Vazhthu nor National Anthem was played.